The Master has proven time and time again that, despite often overly convoluted plans in which he himself is the instrument of his own destruction, he is more than capable of going toe to toe with the Doctor on an intellectual level, highlighting the ease with which the Time Lords could run rampant across all of time and space should they so choose. Likewise, the Daleks through sheer force of will and steadfast belief that they are the supreme beings in the universe have proven to be arguably the Doctor’s greatest foes for entirely different reasons. 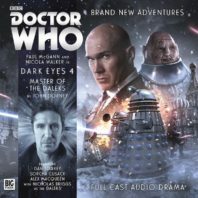 With both featuring so prominently in different portions of the Dark Eyes saga, John Dorney’s engagingly titled ‘Master of the Daleks’ finally brings these two together in featured roles as all of history hangs in the balance. Truly, the Master and the Dalek Time Strategist amount to a formidable duo, and the Doctor’s TARDIS being at the very centre of a corrupted timeline in which the two have gained a foothold on 1921 Earth to put into plan a motion to create millions upon millions of Daleks is a horrifyingly effective and visual proposition. The Master, of course, is fully aware that the Daleks will eventually betray him, a fact he gloriously plays up with false astonishment when Liv confronts him, but he has realised that he has gone as far as he can on his own and now requires the use of a private army. Naturally, he does have a backup strategy when he is betrayed even before he can do the betraying, but this tenuous relationship of power-hungry beings helps to lend a genuine sense of scope and danger to proceedings that also brings out the very best from Alex Macqueen who is able to portray an incredible range of emotions in a very short span of time. Of course, ‘Master of the Daleks’ is notable for bringing much more together than just the Master and the Daleks, and as human lives for Dalek conversion begin to run low on Earth, no race seems quite so aptly suited to fill that role than the Sontarans who are built upon clone technology. Dorney has an implicit understanding of the Sontarans and their militaristic foundations and pure bravado, and this story in a brief moment provides one of the finest examples of their true potential as formidable enemies before the might and numbers of the Daleks overwhelm them. Although it hardly needs saying, Dan Starkey has by now perfected the vocal mannerisms of the Sontarans, and he provides yet another unique angle to this grand production that so boldly ties together the Doctor Who universe at large. Along those same lines, it seems only natural that Molly O’Sullivan whose dark eyes spawned this entire vast epic should also return to the fold here, though the means by which she does so is wholly surprising. This is not a case in which the Doctor finds his missing companion and the two are able to easily pick up where they left off since several decades have passed from Molly’s perspective during which she picked up the surname of Carter. She has tried to blend into the background as best as possible while still striving to help out whenever she can, but she always knew that at some point the greater truth would find her once more. Without question, due credit must be given to Sorcha Cusack who is so deftly able to take over for Ruth Bradley while capturing the essence of her dialect and mannerisms so perfectly. In fact, Nicola Walker and she share an immense chemistry together that captures the emotions stemming from everything their characters have been through over the years, making their reunion so long in the making all the more resonant. It would have been easy for ‘Master of the Daleks’ to devolve into pure spectacle with little meaning while narratively collapsing under the combined weight of the Master, the Daleks, and the Sontarans. However, Dorney manages to achieve the seemingly impossible while highlighting everything that makes these characters so unique and also spotlighting Liv and Molly. Strangely, the only aspect that doesn’t quite work is the Doctor who spends much of the story walking around in an amnesiac daze, not because Paul McGann is anything less than captivating but simply because the story doesn’t quite seem to have room for him to do anything meaningful. However, with his proclamation that he will end this once and for all as the grand finale awaits, ‘Master of the Daleks’ ably stands on its own merit and sets all the needed pieces in motion.